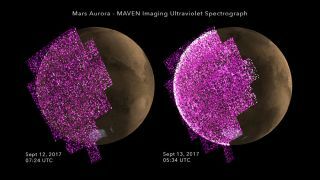 These images from the Imaging Ultraviolet Spectrograph instrument aboard NASA's MAVEN orbiter show the appearance of a bright aurora on Mars during a solar storm in September 2017. The purple-white colors show the intensity of ultraviolet light on Mars' night side before (left) and during (right) the event. A strong solar storm recently sparked a global aurora on Mars that was more than 25 times brighter than any ever seen before on the Red Planet, researchers say. NASA's Mars Atmosphere and Volatile Evolution (MAVEN) orbiter and Curiosity rover both observed effects from the event on Sept. 11, 2017. Curiosity's Radiation Assessment Detector (RAD) instrument measured radiation levels on the Martian surface that were more than double any previously recorded, agency officials said. RAD has been monitoring radiation levels on the Martian surface since Curiosity's August 2012 landing, in an effort to help researchers better prepare for future human missions to the Red Planet. "If you were outdoors on a Mars walk and learned that an event like this was imminent, you would definitely want to take shelter, just as you would if you were on a spacewalk outside the International Space Station," Hassler said in the statement. The storm was an eruption of solar plasma called a coronal mass ejection (CME). CMEs that hit Earth can trigger powerful geomagnetic storms, which ramp up the northern and southern lights and sometimes disrupt communications and power grids. Animation showing the sudden appearance of a bright aurora on Mars during a recent solar storm. The purple-white colors show the intensity of ultraviolet light over the course of the event, from observations on Sept. 12 and Sept. 13, 2017, by the Imaging Ultraviolet Spectrograph instrument on NASA's MAVEN orbiter. Earth's magnetic field funnels the particles that cause auroral displays toward the poles. But Mars doesn't have a global magnetic field, so the effects can be much more widespread, the researchers said. "When a solar storm hits the Martian atmosphere, it can trigger auroras that light up the whole planet in ultraviolet light," Sonal Jain, a member of MAVEN's Imaging Ultraviolet Spectrograph instrument team, said in the statement. "The recent one lit up Mars like a light bulb." CMEs also produce secondary particles when they interact with the Martian atmosphere, NASA officials said. These particles still need to be studied, to ensure that future human explorers will be adequately shielded, they added. The observations by MAVEN and Curiosity should also shed light on Mars' history and evolution, the researchers said. "We expect to get a better understanding of how the process operates in the upper atmosphere of Mars today, and a better understanding of how storms like this may have stripped away much of the Martian atmosphere in the past," MAVEN principal investigator Bruce Jakosky, of the University of Colorado Boulder, said in the same statement.